The geometric arrangement of this lattice structure is spacious, giving water the most unusual property of having a solid phase that is less dense than its liquid phase. At 0°C, water has a density of 1000 kg m-3, whereas pure ice (Jh) has a density of 917 kg m-3. Ice floats in its own melt, one of few substances to do so. Diamonds, germanium, gallium, and bismuth, all structurally similar to ice, also float in their own liquid. Imagine the sight of sunlight sparkling off of a diamond-berg in a sea of liquid diamond! But this is not to be found at Earth's surface temperatures and pressures. 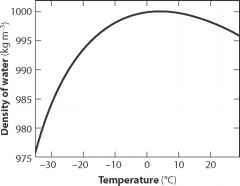 Figure 2.2 plots the density of pure ice and water as a function of temperature. This plot also illustrates the unusual density inversion for freshwater. Pure water has its maximum density at 4°C, and it becomes less dense as it cools below this. The reason for this is not fully understood, but it is related to the angle of the hydrogen bonds in the rigid, low-density crystal lattice that characterizes water in its solid phase. To quote James Trefil, "water never quite forgets that it was once ice." Figure 2.2. 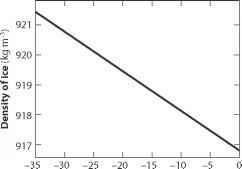 Density of (a) pure water and (b) ice as a function of temperature at mean sea level pressure. Maximum freshwater density is at 4°C. water molecules, causing it to behave more like a regular liquid. Where salinity exceeds 24.7 ppt, density increases continuously as temperature drops to the freezing point. This is the case in most of the world's oceans. Seawater with a salinity of 35 ppt freezes at -1.9°C. Once frozen, ice behaves like most solids, with increasing density as temperature drops; pi = 920 kg m-3 at -23°C (figure 2.2b) and values reach 922 kg m-3 for the coldest ice to be found, in the Antarctic ice sheet. Ice density also increases slightly with pressure. The volume compressibility is about 1.2 X 10-10 Pa-1, giving a density of 921 kg m-3 under the load of 4 km of ice, which is typical of the East Antarctic plateau. The density of snow is less than that of crystalline ice. Snowflakes are composed of an arrangement of ice crystals, but snow that accumulates on the ground is a porous medium dominated by air pockets. Fresh, dry snow has an average density of about 100 kg m-3, but this ranges from 20 to 200 kg m-3 or more, depending on the temperature, wind, and liquid water content during deposition. Densifi-cation occurs as snow settles and compacts, with dry snow densities increasing to as much as 400 kg m-3 in seasonal snowpacks that are subject to strong wind packing. Once the melt season begins, or in snow that becomes saturated from a rain event, further packing and sintering of grains increases the density to values of ca. 500 kg m-3. Spherical packing models (which assume identical, individual spherical grains and air-filled pore space) predict a maximum density of 550 kg m-3. Liquid water or refrozen ice in the pore spaces can further increase the bulk density. Figure 2.3. Average density of the snowpack as a function of day of year from four sites at Haig Glacier in the Canadian Rockies (50.7° N, 115.3° W). The upper three sites are on the glacier, and the lower site is from the glacier forefield. in this compilation vary from 0.55 to 4.32 m (150 to 2160 mm water equivalent). The evolution of snowpack density is similar at all sites; fresh snow settles to densities of 300-350 kg m-3, where it remains through the winter months, and a sharp increase in density accompanies warmer conditions and the onset of melting in May. In the accumulation area of a glacier, snow that survives the summer melt season undergoes a gradual transition to firn and then glacial ice. This transition is accompanied by ongoing densification. The process is continual, and there is no clear distinction between snow and firn. In mountain glaciers, firn is often defined as snow that has lasted at least one melt season. This description does not apply to the polar ice sheets, however, where firn forms in the absence of melting. Firn can be loosely defined as dense, multiyear snow, with typical densities of 550 to 830 kg m-3. The upper limit is well defined. This demarcates the transition from firn to ice, associated with closure of the pore space. In coastal mountain environments, where temperatures and snow accumulation rates are high, the transition from firn to ice takes place in a matter of years. This requires about 2500 years on the cold, dry plateau of East Antarctica. The density of river, lake, and sea ice is similar to that of glacial ice during formation, with little or no air-filled void space. There can, however, be liquid water pockets, and sea ice contains brine pockets that give it a bulk salinity that is intermediate between the salinities of sea-water and freshwater ice; 5-10 ppt is typical for first-year sea ice. There are also solid salt precipitates in sea ice. These inclusions can elevate the density, with measured values of up to 940 kg m-3. As freshwater and sea-i ce melt, vertical drainage channels form, absorbed shortwave radiation can melt subsurface ice, and the ice can deteriorate or become "rotten," with macroporous air pockets and channels. 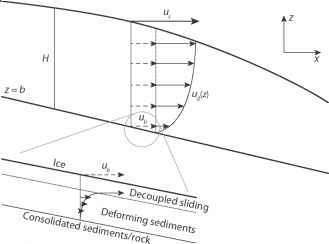 Ice densities during decay can drop to 700 kg m-3 or less in surface ice.